Some people look at me like I’m nuts when I talk about chocolate covered potato chips but then I know they’ve never eaten any. Chocolate covered potato chips are the perfect combination of salty and sweet and I can never eat just one! 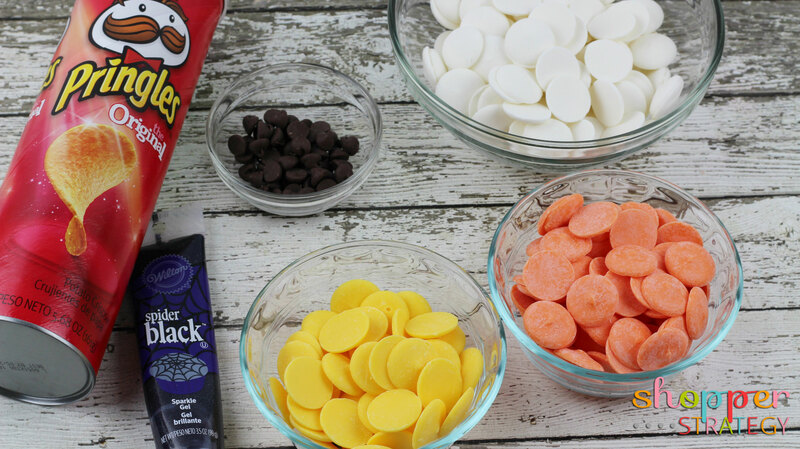 This Halloween themed recipe featuring ghost and candy corn chocolate covered chips is just as fun to make as they are to eat. We use Pringles for our chocolate covered chips recipe because they’re sturdy, hold the chocolate well and are all the same shape. Wilton candy melts are super easy to work with this spider black sparkle gel worked great for the ghost features. These chocolate covered potato chips are super easy to make, simply melt some white candy melts for the first coat, or only coat for the ghosts, and dip the chips one at a time until covered. Place them on wax paper to cool. 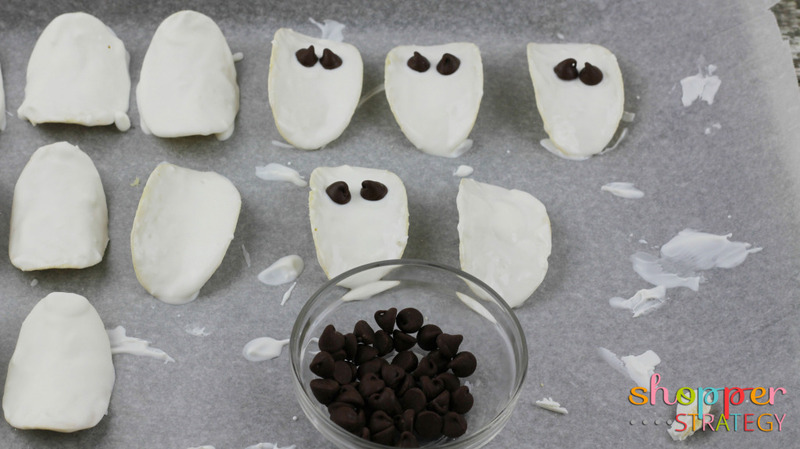 Use chocolate chips for eyes on the ghost chips, placing them before the white chocolate cools completely. Next use the spider black sparkle gel for the ghost’s mouths. If you don’t have chocolate chips on hand you can use the gel for the eyes as well. 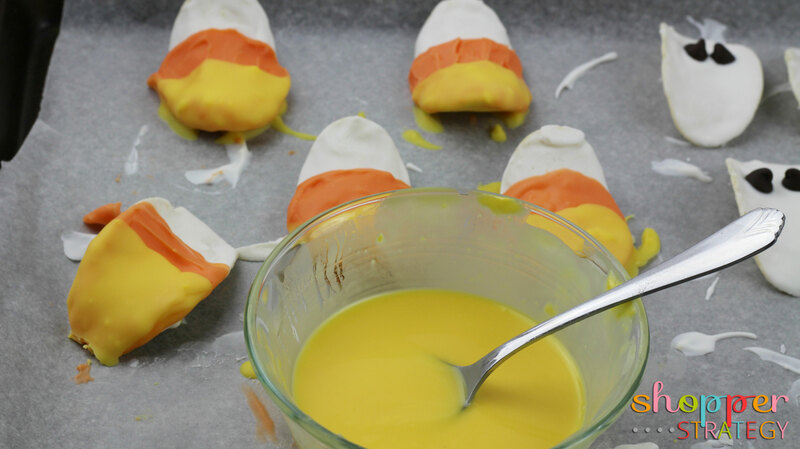 For the candy corn chips you’ll also need to melt some orange candy melts and dip the chips about half way, then once they’ve cooled completely you dip a final time in yellow candy melts on the bottom third of the chips. 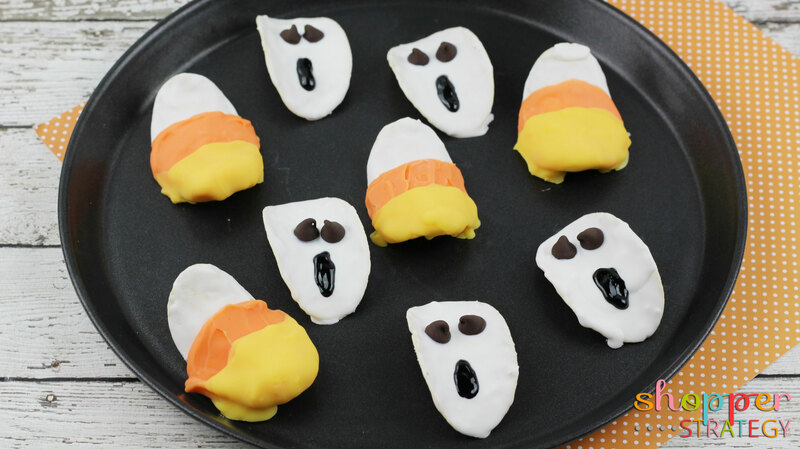 Line a large cookie sheet with wax or parchment paper and set aside. Dip each chip into the melted white chocolate, covering each chip entirely. Allow any excess chocolate to drip off. Place on the cookie sheet for 15 minutes to allow the chocolate to harden. 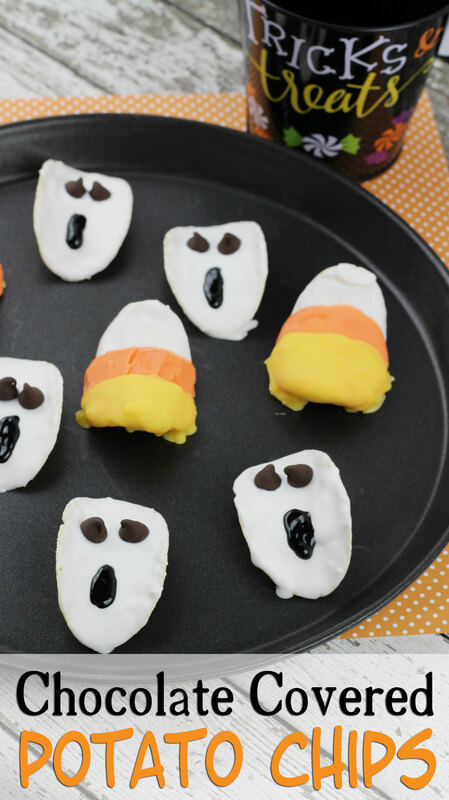 Once the chocolate is hardened, use the black tube of icing to pipe on the eyes and mouth of each chip for the ghost face. In a microwave safe bowl, microwave 1 Tablespoon solid shortening for 45 seconds. Add the white chocolate melts and stir until melted and smooth. In a microwave safe bowl, microwave 1 teaspoon of shortening for 30 seconds. Add the orange chocolate melts and stir until smooth and melted. 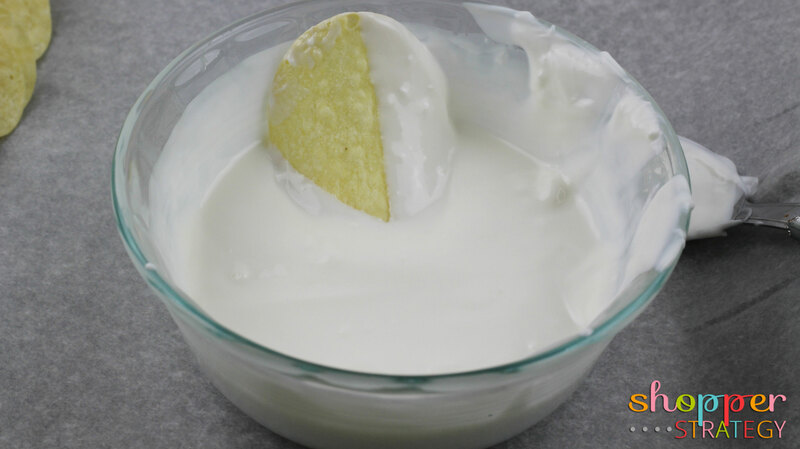 Dip each chip into the melted orange chocolate and cover ½ way up the chip. Place back on the cookie sheet for 15 minutes so the chocolate can harden. Lastly, in a microwave safe bowl, microwave 1 teaspoon of shortening for 30 seconds. Add the yellow chocolate melts and stir until smooth and melted. Dip the bottom ⅓ of each chip into the yellow melted chocolate. Play back on the cookie sheet for 15 minutes to allow the chocolate to harden. I LOVE chocolate covered chips!!! Hoping you’ll share these! Oh my goodness, these are so cute and look so yummy! !